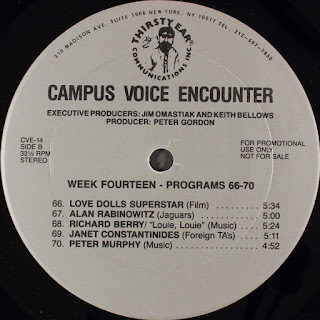 Campus Voice Encounter was a pre-packaged college radio show produced by Whittle Communications Campus Voice Network, and distributed by Thirsty Ear records on LP in the 1980s. Their promotional garbage claimed it was distributed to 1.3 million "dorm students". I suspect that's the number of college radio stations on their mailing list, multiplied by the on-campus populations of their respective universities. This is of course "magic math", and not a calculation to be respected by grown adults. But the number of listeners was not inconsequential. And the limited pressing LPs are collected and traded by enthusiasts. The below logo was registered in 1987, giving the series a probable start date. It's producers were Jim Omastiak, Keith Bellows and hosted by Peter Gordon. You will notice the program numbers skip, add, subtract, repeat, overlap and loop. These are not typos. It may have been accidental, deliberate, or bad copy-editing but the odd numbering adds to the discographical fun. I will continue to refine the below discography as I find discs. I have found a number of references to more episodes or segments I've been unable to corroborate.